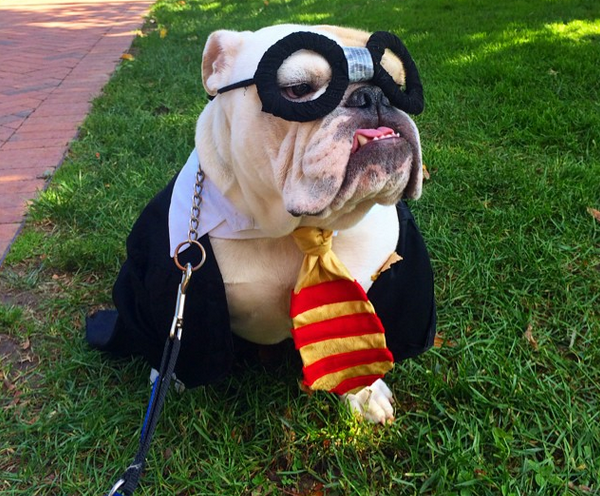 When Will the PC Nonsense End … Is Your Dog’s Halloween Costume Sexist? What now we have a war on Halloween? The WAPO asks, in a never-ending liberal agenda and wusification of America, is your dog’s Halloween costume sexist? Seriously folks, really? This is what you consume your time with? Because some how if a female dog is dressed up like a French maid and a male dog is a doctor or fireman, that is the end of the world and going to cause irreparable harm to little girls? GET OVER YOURSELF! I asked the same question that was posed at Twitchy, how the hell did this get into the pages of the WAPO and how is this journalism? These fools will only be happy if a male bulldog is dressed in a pink tu-tu with a fucsia boa. Can liberals just leave stuff alone and take their meds? Young girls may be discarding their princess wands for superhero capes this Halloween, but not so in the canine world. The glass ceiling appears to be firmly in place at PetSmart, where career costumes labeled “male” include firefighter and police officer, while female dogs can choose between a pink cowgirl costume and pink loofah. The parents of missing Madeleine McCann have released a picture the other day of her dressed as a pumpkin with a special Halloween message, and urged people not to give up hope of finding her. The UK Mirror reported that last week, the Metropolitan Police cut the number of detectives working on her case from 29 to just four. However, her parents said they “remain hopeful” they will find her. That is all any parent can hang on to with a missing child is hope. 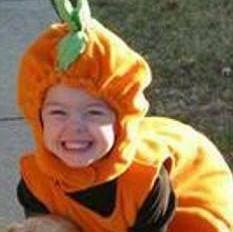 The parents of missing toddler Madeleine McCann have released a picture of her dressed as a pumpkin in a special Halloween message, as they urge people not to give up hope of finding her. They posted the Halloween picture on the Official Find Madeleine Campaign Facebook page yesterday to remind the world that little Maddie still hasn’t been found. The picture was posted alongside a short message that simply read “Happy Halloween”. Madeleine went missing on holiday in Praia da Luiz, Portugal, on May 3 2007. Facebook: Official Find Madeleine Campaign. We would like to thank all the staff from Operation Grange for the meticulous and painstaking work that they have carried out over the last four and a half years. The scale and difficulty of their task has never been in doubt. We are reassured that the investigation to find Madeleine has been significantly progressed and the MPS has a much clearer picture of the events in PDL leading up to Madeleine’s abduction in 2007. Given that the review phase of the investigation is essentially completed, we fully understand the reasons why the team is being reduced. We would also like to thank the Home Office for continuing to support the investigation. Whilst we do not know what happened to Madeleine, we remain hopeful that she may still be found given the ongoing lines of inquiry. 22 year old Chelsea Bruck has been missing since late Saturday – early Sunday morning, October 25-26, 2014 in Frenchtown Township, Michigan. Chelsea Bruck was last seen Saturday night/Sunday morning at a Halloween party on Post Road in Newport that she attended with co-workers and got a ride with there with them as she does not have a driver’s license. 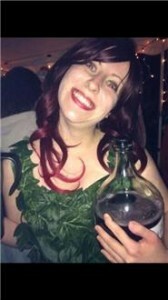 Bruck was last seen wearing a “Poison Ivy” costume. The missing girl’s sister, Kassandra, said there could have been as many as 800 people in attendance at the Halloween party where Chelsea was last seen. She was first reported missing Monday morning. FACEBOOK: Help Find Chelsea Bruck. Chelsea Bruck’s family hasn’t heard from her since Saturday night when she left for a Halloween Party on Post Road in Frenchtown Township. Bruck was last seen wearing a “Poison Ivy” costume consisting of black pants and a leaf-covered top. “The big concern is she doesn’t drive. Friends left and we don’t know how she got home, who she was left with, what time she left. Her friends had her phone, had her bag, so she doesn’t have that for us to contact her. But she obviously hasn’t borrowed anyone else’s phone to post on her Facebook or to call,” Leannda Bruck said. Family members and police have been searching by foot, ATV and by air throughout the area. UPDATE I: Monroe County Sheriff’s Office released a composite sketch of a man they want to talk to. Late Tuesday afternoon, the Monroe County Sheriff’s Office released a composite sketch of a man they want to talk to about Bruck’s disappearance. Investigators said a witness reported seeing Bruck around 3 a.m. Sunday with the man. He is described as white with medium length dark hair, a thin mustache, and had facial hair. 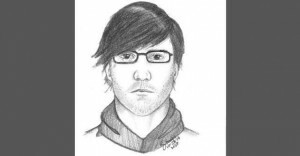 He was wearing a plain black hooded sweatshirt with no visible logo and black framed eyeglasses. UPDATE II: Sketch released in case of missing Monroe Co. woman. A close family friend tells NBC24 that they and authorities plan to pursue new leads Wednesday as tips have started to come in regarding Chelsea Bruck’s disappearance. On Tuesday afternoon, hundreds of tips were submitted after a sketch was released of a man seen by a witness with the 22-year-old at a Halloween party in Newport on Saturday night. The Maybee, Michigan native was seen with him heading towards a location where vehicles from the party were parked. The witness reported seeing the pair, in the area around Post Road, at around 3:00 a.m. Sunday. Bruck is not believed to have been seen or heard from by anyone else since that time and was reported missing on Monday. UPDATE I: Police searching for party security guards for questioning about missing Monroe woman. Monroe police are searching for two men in connection to the disappearance of Chelsea Bruck after a Halloween party last week. Police are searching for the security guards that were hired for the party, shown in the image above, to ask them questions about the party. The men are not suspects in the search, but police want to find out more about what went on during the party. UPDATE II: Sister of missing Michigan woman hopeful in search since disappearance at crowded Halloween party. ‘We just know we’re going to find her,’ Kassandra Bruck, 24, told the Daily News of her missing sister, Chelsea Bruck, who vanished from a Halloween bash at a rural property in Monroe County, Michigan early Oct. 25. Her sister was last seen dressed as Poison Ivy at the costume party that swarmed with at least 600 people. UPDATE II: Remains of missing 22 Year Old Chelsea Bruck found and positively identified. The remains have been found of 22 year old Chelsea Bruck in Monroe County’s Ash Township, Michigan. Bruck’s skeletal remains were discovered Friday afternoon in dense woods near Interstate 275. The Wayne County Medical Examiner positively identified the body as Bruck on Saturday. 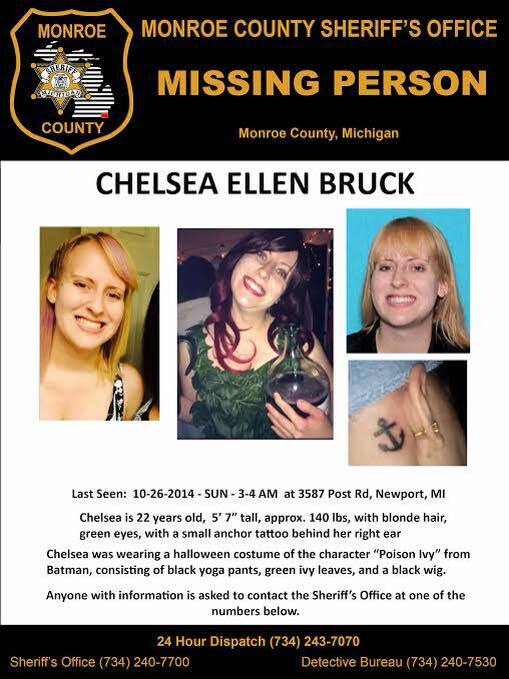 Chelsea Bruck went missing on 10/26/14 after attending a Halloween party in Frenchtown Township, Michigan. A mechanical failure is being blamed for the fatal crash that killed a teenager and injured many others during a haunted hayride in Mechanic Falls, Maine. 17 year old Cassidy Charette was killed and 22 other were injured Saturday night during the Gauntlet Haunted Night Ride at Harvest Hill Farms in Mechanic Falls, west of Lewiston, Maine. The accident took place when a hay wagon being pulled by a Jeep lost control and careened down a hill, where it struck a tree and overturned. The Saturday night crash claimed the life of 17-year-old Cassidy Charette of Oakland, Maine, according to the Maine Sate Fire Marshal’s office. They say that two others were seriously injured. The operator, 54-year-old David Brown of South Paris is being treated at Central Maine Medical Center. A 16-year-old, Connor Garland of Belgrade, was transported to Boston Children’s Hospital for treatment. Authorities say all 23 people on board were injured. The Fire Marshal says injuries include broken legs, arms, shoulders, and backs. Many of those injured were treated and released Sunday, but some remain hospitalized. A teenage girl was killed and 22 others were injured in a hayride crash in Mechanic Falls, Maine, on Saturday night. HAPPY HALLOWEEN FROM PC AMERICA … DOUBLE STANDARD LIBERAL POLICIES!!! Remember when a Halloween party was a Halloween party and you could wear crazy, spooky, evil, funny, costumes and it was all in fun? Well those days are over as the PC police are at it again. It is now considered rasists and offensive to dress up like Barack Obama. A man at the Jennie Stuart Medical Center in Hopkinsville, Kentucky wore a Barack Obama costume to his work’s annual Halloween party complete with mask and straight-jacket. The result was that all 750 employees were required to take diversity training because of this. HUH? Yup, one person’s costume because it was if the Obamamessiah caused individuals to complain. Has the world gone completely mad? The VP of HR at his company may need a mental evaluation. How does dressing up like Obama for Halloween in turn result in sensitivity training? Just curious, how is such behavior considered offensive and require sensitivity training when SNL mocks the president all the time like HERE and HERE? I actually think its pretty offensive to force people to buy a product or face a tax, or its pretty damn offensive to rack up a $17 trillion federal debt and it is damn sure offensive to leave four Americans to die in Benghazi and not lift a finger to help them and then blame it on a video tape. The ridiculousness of this kind of nonsense has reached epic proportions. I think it is a safe bet that some one will always be offended by an action that another does. Sadly, this country has gotten worse under Obama. A picture of a Jennie Stuart Medical Center employee wearing a President Barack Obama mask and straitjacket at the hospital’s annual costume party has stirred debate. As a result, all 750 employees have now been required to take diversity training. The VP of Human Resources at the medical center issued a statement to staff apologizing for anyone who was offended and personally took responsibility since the incident occurred on his watch. Because as stated at Weasel Zippers, like diversity training would have been required if some one worse a George W. Bush mask and made people feel … uncomfortable. Yea, I am sure they would have done the same with a Sarah Palin costume as well. A note to all … if you wear an Obama costume in a straight-jacket and show up for Halloween, you will get extra candy. If you have a teleprompter or empty chair, you may get it all!! !